She's back. Last year's diva. And this time, thanks to a bit o' craft paint, she's got stripes. Behold the zebringo. Or flamibra. I haven't made up my mind yet. And look-y look what I got in the mail from my sister. How she knew I was going trashy this year, I'll never know. So unexpected. But she could feel it with her sisterly vibes and vortexes and such and knew that a trailer trash tree isn't complete without a random shopping cart parked in it's boughs. Or can only holly have boughs? In any case, FAVORITE. ORNAMENT. EVER. P.S. 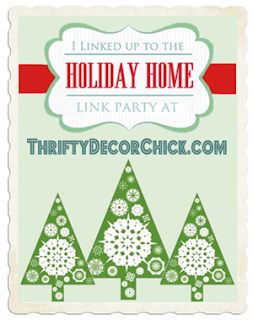 Sarah's having a Tree Party starting tonight - go get inspired. You have seriouly got to be one of the funniest ladies ever! And this tree is so YOU!!! I love it! Beyond brave. You are the best mom ever...if I ever put a flamibra and a shopping cart on my tree, my kids will arise and call me blessed until the cows come home. Or the flamibras. Either way. This is the rockin'est tree I've seen in blogland, and that ain't no lie. I am in love. A zebra flamingo is the most awesome thing ever! You are a genius!!!!!! Oh what a great tree!! Love the shopping cart :) You have a fun blog! New Follower. Does you Zebringo-chick have a name? Wow, that is the coolest.tree.ever. Thanks for stopping by an liking my Ladder Tree - too bad you can't do it - darn hubbies really cramp our decorating style! I LOVE your zebringo! Plan on including it in an upcoming post! Thanks. Your zebringo is fabulous! Your tree looks great! Love the shopping cart ornament! Thanks for stopping by my blog and commenting on our baseball tree today. Oh my, I didn't know you last year, so this is new to me. I LOVE it....She should be in my window box!! The shopping cart has me laughing and smiling. Now THAT is funny!! Love it and will be featuring it in a post! Zebringo is a better name than flamibra, no contest. Love your zebra flamingo!! I have a floozie tree (as my children have dubbed it) every year. I put it in my sun room so EVERYONE can see-lol-I love to embarass them as much as possible. I also love/want the shopping cart ornament. Where did you find??? flamingo! it's my first time to see a flamingo up on a pine tree.. now that's unusual.. LOL love it. Wow, where did you get all those pretty ornaments, and I can clearly see the push cart, ooohhh so cute!